Canadian Canoe Routes • View topic - Pocket chain saw for portage maintenance? Post subject: Pocket chain saw for portage maintenance? I wonder if someone can share opinion on using a pocket chain saw for occasional portage maintenance. I currently carry 7.5" Bahco folding saw for this purpose, but looking for something to take care of bigger trees, 7-10+ inches. I also have 21" Sven, but due to its triangular frame it's not very effective for cutting bigger trunks. Post subject: Re: Pocket chain saw for portage maintenance? This saw should work just fine for the application you mentioned. Silky saws have Japanese-style cutting teeth that were not designed to be sharpened... a look at google shows they can be sharpened with a specialized diamond-shaped file that looks expensive and sharpening their tri-edged cutting surfaces will take some time. Silky suggests just replacing the blades which means money. The regular wood saw teeth can be sharpened much more easily by clamping in a vise and using a plain old flat file ...seems much easier. Without being a professional tool an ordinary 16" saw can nonetheless handle felling and bucking pretty substantial timber. You can get a much smaller unit which would be more appropriate to camping use, and a lot of the new saws also have various options for easier starting that my older unit does not. Without naming names, I have three different gas power tools from one manufacturer, none with the so-called easy2start option, they all start very reliably which I'm reasonably confident is true for all the big names these days, Stihl, Husqvarna, Echo and so on. If you're worried about a health issue. a few hundred bucks for a quality saw is worth every penny. I too have reached the age where my back is now the weakest link, and I won't hesitate to throw technology at the problem when the time comes. Until that time, my weapon of choice is the agawa canyon product. Way overpriced compared to some of the alternatives, but I just like it for being a bombproof Canadian quality product. Steve E: from what I heard, pocket chain saws require serious physical effort to operate and may be not the best option while having back issues. Unless you are talking about gas-fueled saws. On the other hand Japanese Silkies, as frozentripper mentions, could be expensive if used routinely, e.g. for firewood. I'm thinking myself about Big Boy 2000, but as I said it will be used quite casually. My 7" Bahco can take care of most problems where I travel. i see the OP is from NJ. Please note that if you plan to go to public state owned wilderness areas of the Adirondacks or Catskills, use of motorized anything (including chain saws) is illegal. Professional and volunteer trail crews are exempted only during certain seasonal windows (mostly just during the colder months). In addition, even if you are operating on trails during legally allowed times, on state lands you must have specific trail location permission to operate from the NYSDEC, and have taken a safety course with a safety certificate issued from a certified NYS chain saw safety instructor. Thanks, nessmuk. My question concerns exclusively pocket chain saws, which by definition are not motorized. Judging by answers here it looks like nobody's familiar with this kind of saws. The hand chain saws aren't easy to use. Go to YouTube and search "hand chain saw review." I remember seeing a description of how a guy who had one would take a green branch, bend it, and tie the hand chain saw across the bend to create a bow saw. It looked like a hassle. But they aren't expensive. Buy one and try it out. The Silky folding saws are terrific. Get one which is long enough to handle the diameter of wood you expect to encounter. I have a Big Boy; several friends have Katanas. I carry one on my snowmobile, and I bring one in my kayak when doing creek runs which may have wood which needs to be removed. I have friends who do some pretty extreme backcounty motorcycle riding, and they frequently cut out foot thick logs with them. My sister is real active in trail maintenance and construction, and she carries a Silky folding saw. In the pictures shown below, we were cutting branches off a log with a Silky Katana so we could run our kayaks underneath it. 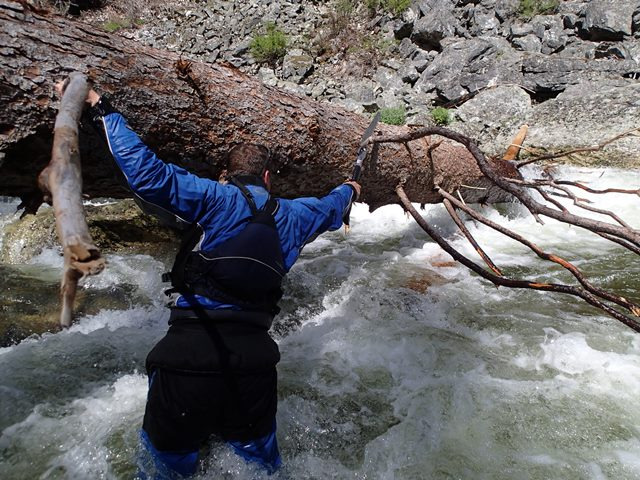 The log was too big to cut by hand with a saw which would fit in a whitewater kayak, and if we had cut it, it would have probably have fallen down, wedged in place, and blocked the creek. Last edited by pmmpete on October 25th, 2018, 8:04 am, edited 9 times in total. This a very light chainsaw, but will get you through most boondoggles. I can cut with it for a long time and feel no arm strain at all. It's my favorite saw for light clearing right now. Since we have drifted to real chainsaws I will add this. 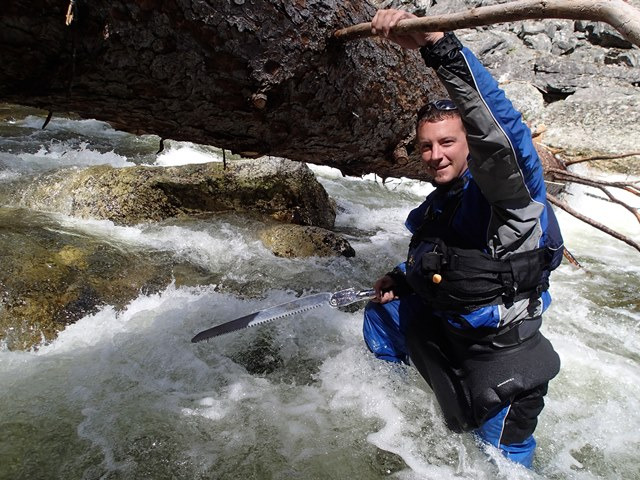 I often tote a chainsaw on remote canoe trips so the big stuff can be cleared off the portages and from across the water. The arborist saws really shine for this. They are tophandle saws so can be wielded with one hand from the canoe (one handed cutting is dangerous so use caution.) I use a Jonsered 2236T with 14 inch bar. Yes, I knew that, but gas chain saws came up within a post or two so I thought I'd make the use rule clear on them in my Adirondack back yard. I have used the cheap hand wire saws a few times in the past, but was not very satisfied with them. They break too easily. Sorry, that was my post that hijacked the topic and I certainly missed the geographic clue there. In my defence I did mention my folding handsaw though! and I do have a pocket chainsaw somewhere, tried it once and found it to be more of a novelty concept than anything. I tried a hand chain saw and found it very energy consuming. A folding saw is way more efficient. Here's the video on how to make a DYI folding saw. I made my first one like this 25 years ago and still use it on every camping trip I go on. Works great.